In a swing state that's central to his fortunes, local GOP leaders say there's almost no sign of Donald Trump's operation. Nearly everyone can agree that Donald Trump’s path to the White House goes through Pennsylvania. But local party leaders in some of the state’s most pivotal counties say there’s been almost no outreach from his campaign so far, and there’s scant evidence of any Trump-driven ground organization. What infrastructure is in place lags behind the Democratic coordinated campaign on behalf of Hillary Clinton. “The Trump campaign has not specifically reached out to me,” said Bill Urbanski, the GOP chair of Wilkes Barre’s Luzerne County, a populous county in northeastern Pennsylvania where, according to a recent Republican poll, Trump led by 17 points. Trump will need a heavy turnout in counties places like Luzerne and Westmoreland to offset Clinton’s advantages in the two big-city Democratic strongholds on either end of the state, Pittsburgh and Philadelphia. So far, though, local officials report little interaction with the Trump campaign. When there is outreach, Korns said, it’s not always from credible or official sources. “There are a number of individuals, with varying levels of authority, some self-appointed, some not, that sort of float around on that campaign, so it’s definitely been a bit of a learning curve on our end,” Korns said. Trump’s strategy differs from past nominees in that it cedes organizational control and direction to the Republican National Committee and the state party. And several GOP county leaders stressed that the state Republican Party is in contact with Trump’s operation — Paul Manafort, Trump’s campaign manager, has been in touch with the GOP state chair, as has Jim Murphy, the campaign’s new political director. Local officials noted that the state and local parties were working hard on the GOP nominee’s behalf, in coordination with the Republican National Committee, which has 54 paid staffers in Pennsylvania and “hundreds of trained organizers and volunteers,” according to a spokeswoman. ‘That person cannot be me,’ says Johnson in surprise announcement. 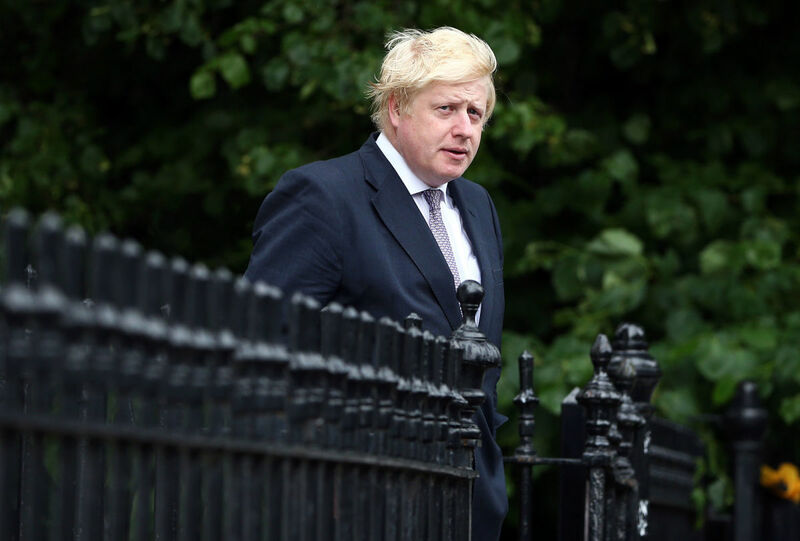 The former London mayor’s surprise decision followed the equally unexpected announcement earlier on Thursday that his fellow Leave campaigner Michael Gove, the justice secretary, was throwing his hat in the ring for the Tory leadership. “My role will be to give every possible support to the next conservative administration,” said Johnson. Cracks in the Gove-Johnson alliance first became apparent when an email sent by Gove’s wife Sarah Vine leaked Wednesday. The email, intended for Gove, urged her husband to seek specific assurances about his future role before announcing his support for a Johnson candidacy. U.K. Home Secretary Theresa May and Energy Minister Andrea Leadsom, another Leave campaigner, also announced their intention to run. The sudden interest in North Carolina is a sign of Donald Trump's recent slide in the polls. When President Barack Obama and Hillary Clinton take the stage for their symbolic joint rally on July 5, it will send a subtle but unmistakable signal about the evolving outline of the swing state map. By announcing Wednesday that the rescheduled event will take place in Charlotte, North Carolina, rather than Green Bay, Wisconsin — the original plan several weeks ago — the presumptive Democratic nominee’s campaign telegraphed that it sees newfound promise in a battleground state that narrowly rejected Obama in 2012. Earlier this month, the major pro-Clinton super PAC Priorities USA Action signaled the same, announcing it would expand its swing state ad barrage beyond its original list to North Carolina. It’s a reminder of the fluidity within the swing state universe, but also a sign of Trump’s decline in national and swing state polling over the past two weeks. Holding Clinton’s highest-profile rally yet in North Carolina suggests national Democrats see an opportunity to go on the offensive and expand their map there — an investment that could have a higher return than placing it in a battleground state like Wisconsin where Republicans have lost in seven straight presidential elections. In the three weeks since Obama endorsed Clinton and her campaign originally announced that they would be appearing together in Green Bay, the political ground has tilted decidedly toward Clinton. Between Trump’s response to the mass shooting in Orlando (the cause of the rally delay in the first place), the firing and replacing of his campaign manager, and the revelation that his campaign has far less money than widely expected, the national polling average has grown in Clinton’s favor to 6 points. As a result, Democrats on Wednesday viewed the doubling down on North Carolina as evidence of an attempt to seize the political moment, even as they acknowledged a swing state fluctuation that worked against them — potential signs of Trump strength in Pennsylvania, where Priorities recently launched its first ad buys and the Clinton campaign started reserving time. While candidate trips to certain states don’t always tell the whole story of a campaign’s priorities — Obama didn’t visit Florida until late July 2008, for example, and Clinton still hasn’t since she dispatched Sanders — operatives are well aware that they send a public message when they organize events or book the candidate in purple regions. Tuesday’s trip will be Clinton’s second in two weeks to North Carolina, a state where Democrats believe any dollar or minute spent by a Republican is a defensive move that takes away from that opponent’s ability to compete elsewhere. With two recent public trips there, North Carolina is taking on the look of a top-tier state for the Democrat. Only Virginia — which has gotten two trips and $1.7 million of television ad spending from the Clinton camp and Priorities between mid-June and the beginning of July, according to media trackers — and Ohio (four trips, $4.6 million) have been repeat public destinations for her in the general election so far. Still, the one state that both campaigns have hinted will be crucial to them is the old standby: Ohio. For Trump, whose path to 270 electoral votes goes through the Rust Belt, it’s even more important than to most recent Republican candidates, given Clinton’s widely expected strength in Florida — thanks to that state’s growing Latino population and its current status as the single biggest recipient of Clinton and super PAC ad money. Clinton has prominently used two of her high-profile surrogates — vice-presidential contenders, Ohio Sen. Sherrod Brown and Massachusetts Sen. Elizabeth Warren there in recent weeks. And Trump spoke in St. Clairsville Tuesday night after a high-profile speech on trade in Pennsylvania. Clinton allies view her rapid-fire Ohio appearances as a way of pre-butting the week worth of saturation-level earned media Trump is likely to get in the state from his party’s convention in Cleveland in July. “What they’re saying is Donald Trump is going to take this Rust Belt path that has eluded the Mitt Romneys of the world. So if she stops him there, she’ll win the election,” said John Morgan, an Orlando attorney and prominent Democratic fundraiser, reflecting on Clinton’s relative lack of public travel to his state so far. “What did Tim Russert make famous? ‘Florida, Florida, Florida.’ I think this year it might be ‘Pennsylvania, Ohio, Michigan.’ [For Trump,] that’s throwing three no-hitters. 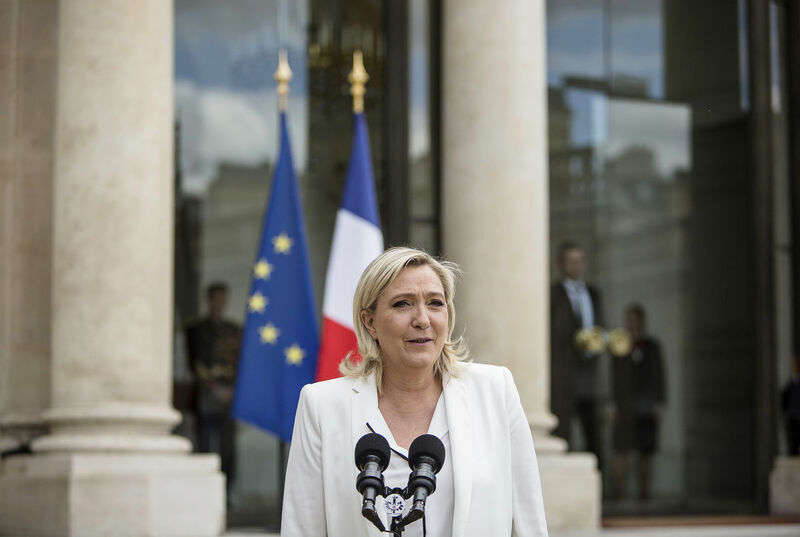 Since 2013, Le Pen has maintained that, if she attains power, she will hold a referendum on France’s membership in the E.U. within six months. 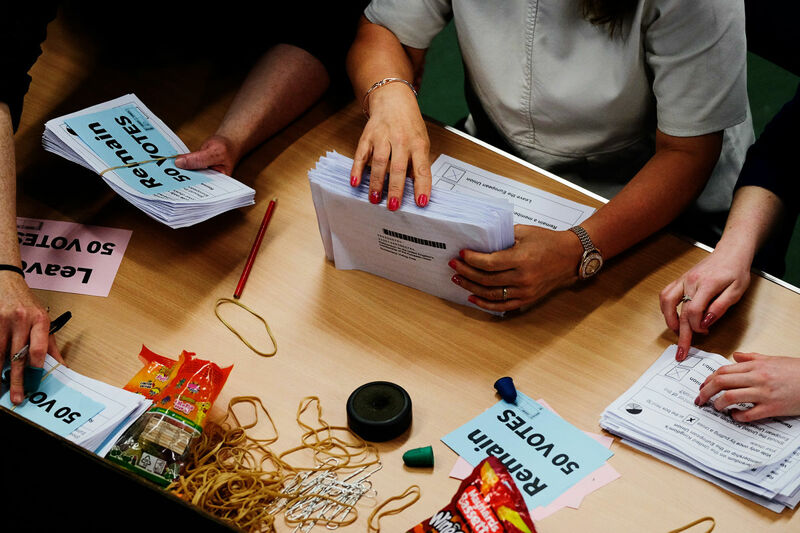 A survey in March found that fifty-three per cent of French voters would support such a referendum, and another, published today, found that only forty-five per cent are certain they would vote to remain. Le Pen consistently leads polls for next spring’s Presidential election, and is all but certain to advance into the second round of voting. On Friday, she proclaimed Britain’s vote a first concrete step toward her vision, and the European question certainly will now become central to the campaign. “Before, this was unheard of,” Florian Philippot, a National Front vice-president and Le Pen’s top strategist, told journalists gathered at the Party headquarters, in Nanterre. “Now it’s no longer unheard of. There’s a precedent, and that changes a lot.” Philippot brushed aside suggestions that Britain’s exit would be painful for France, which is more economically integrated into the E.U., and that the fallout might affect public opinion. “That’s the propaganda of the Europeanists,” he told me, predicting that the market upset was temporary. “They have nothing else to say other than to try to scare people.” Le Pen and Philippot called for a “new European project,” of sovereign and “independent” nations. A rare concurrence between Le Pen and the establishment took shape over the weekend, when Hollande and his Prime Minister, Manuel Valls, agreed that it is now necessary to “invent another Europe.” Of course, the two sides diverge on their conception of what that Europe should look like. Some younger voters, and others who feel that the party organizations in France are increasingly meaningless, are looking to Emmanuel Macron, France’s maverick thirty-eight-year-old economy minister, and his frank, straightforward speaking style. Macron rankled his colleagues in April, when he launched his own political movement, meant to transcend the left-right divide, on a free-market-reform, pro-entrepreneurial, pro-Europe platform. His supporters, who his staff have said number more than fifty thousand, have been going door to door across the country to take measure of French citizens’ concerns, which the movement will present as part of a “diagnostic” at the end of the summer. Who Bombed the Istanbul Airport? When ISIS fighters killed a hundred and thirty people in Paris, in November, the group’s leaders in Syria took credit for the attack the next morning. When ISIS zealots murdered thirty-two in Brussels, in March, the group claimed responsibility the same day. After the attacks in San Bernardino and Orlando, ISIS’s leaders took credit for both, even though they appeared to play little or no role in helping to plan or carry them out. 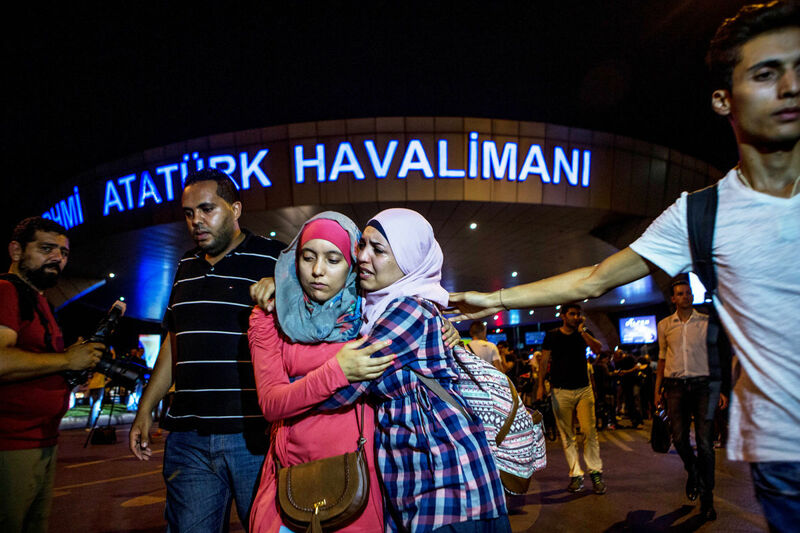 So here we are, more than twenty-four hours after three suicide bombers killed at least forty-one people at Atatürk International Airport, and no one has stepped forward—neither ISIS nor anyone else. Why not? Shortly after the attack, Turkey’s Prime Minister, Binali Yıldırım, said that ISIS was the main suspect. But he didn’t offer any evidence to buttress his claim, and he hasn’t said anything since. John Brennan, the head of the C.I.A., told Yahoo News that he thought that ISIS was probably the culprit—but, like Yıldırım, he showed no proof. So who did it? It’s not inconceivable that the attack was carried out by someone other than ISIS—namely, the Kurdish Workers’ Party, or P.K.K., which has been leading an armed struggle against the Turkish state for decades. The war with the P.K.K. has flared up over the past two years, and the Turkish military has carried out several strikes against both the P.K.K. and the group’s affiliates in northeastern Syria, where they have set up a quasi-independent state. Kurdish militants have carried out suicide attacks before, though, as a rule, the P.K.K. has never targeted foreigners, who would have been present at an international airport. Events will probably prove Brennan and Yıldırım to be correct, that ISIS is to blame for the attacks in Istanbul. There’s certainly circumstantial evidence. The attack, which was carried out by three men wearing suicide vests, is consistent with previous ISIS attacks. June 29th marks the second anniversary of the group’s declaration of a new caliphate in the territory it had conquered in Syria and Iraq. Under relentless Western bombardment, as well as pressure from Shiite militias and the Iraqi military—Iraqi forces expelled ISIS from the center of Fallujah this week—ISIS’s leaders are no doubt desperate to remind the world that they are still a potent force. If the facts ultimately show that ISIS indeed carried out the Istanbul attacks—and if the group maintains its silence—it will also illuminate the deeply complex relationship between ISIS and Turkey that has evolved over the past five years. ISIS owes its existence in part to the Turkish government. In the years following the uprising against Bashar al-Assad’s government in Syria, which began in 2011, Turkey became the main conduit for the tens of thousands of foreigners who flocked to Syria to fight against the Assad regime. Many of those volunteers ended up joining ISIS. The reason that Turkey was the main gateway for jihadists moving to Syria was because President Recep Tayyip Erdoğan’s government wanted it that way. Erdoğan, once a friend of the Assad regime, made the decision that his old friend needed to go, and he was willing to do almost anything to see that happen. Turkey’s five-hundred-mile border with Syria became a sieve, and many of those fighters who joined ISIS used Atatürk International Airport to complete their journey. At the same time, ISIS militants were able to set up networks inside Turkey itself. But even as ISIS has reacted to Erdoğan with anger, the group has been reluctant to take credit for causing bloodshed inside Turkey, perhaps out of concern about alienating the Turkish people. The Istanbul assault, if it was indeed carried out by ISIS, would not be the first attack inside Turkey blamed on ISIS for which the group did not take credit. In January, a suicide bomber blew himself up in Istanbul’s Sultanahmet district, killing thirteen people, all foreigners. According to Turkish authorities, that attack was carried out by a Syrian national named Nabil Fadil, a fighter for the Islamic State. Even so, ISIS never took credit. In March, a suicide bomber blew himself up just off the city’s historic Itiklal Street, killing five people. Turkish authorities blamed the attack on a Turkish citizen who, they said, had links to ISIS. Still, ISIS never took credit. Oddly enough, ISIS’s leaders have been happy to take credit for assassinations—usually of Syrian opposition leaders—carried out in southeastern Turkey. In November, for instance, ISIS released a graphic video claiming responsibility for the murders of two Syrians, including a co-founder of Raqqa Is Being Slaughtered Silently, a group of journalists and human-rights activist who documented ISIS abuses in Raqqa, the Syrian city that ISIS claims as its capital. Terrorism is usually about one of two things: sending a message or making chaos. On the first of these counts, in Turkey, ISIS seems to have failed utterly. How can you send a message if you’re not even willing to take credit for your attack? But on the second count, ISIS, sadly, has been strikingly successful. Among other things, Turkey’s tourism industry has been in a free fall. Its domestic politics are more unstable today than they have been in years. If nothing else, ISIS is making the Turkish government appear weak and ineffectual. When it come to making chaos, ISIS, sadly, knows exactly what it is doing. We have seen the future in Sweden and it works,” Michael Gove told the Daily Mail in 2008. A few months earlier, Gove and other leading Conservatives had visited schools in Sweden for the first time, a journey that they would repeat in the following years. Sweden’s 800 friskolor make up about a sixth of the country’s state-funded schools. Introduced in 1992, they gave parents the ability to use state spending on education to set up new schools and decide where to send their children. In that decade, friskolor were made easier to set up, with companies given the right to make a profit from running them; other schools were decentralised and a voucher system, allowing parents to choose their children’s school and then awarding funds based on parental demand, was introduced. Tony Blair praised the Swedish model in a 2005 government white paper. For Tories, Sweden’s schools held out a simple message: that competition could transform state education in England. That message was appealing because it came from “a social-democratic country, far to the left of Britain”, as Gove put it. This was true but only up to a point. The reforms that he enacted after 2010 – notably the introduction of free schools, the speeding up of academisation and changes to the curriculum – owed as much to US “charter schools” as to educational reforms in Sweden. Even as Gove cited Sweden’s successes in education, its international standing was in decline. Since 2000, standards there have fallen more than in any other country ranked by the Organisation for Economic Co-operation and Development (OECD) using tests known as the Programme for International Student Assessment, or Pisa. Results released in 2013 rated Sweden below Denmark, Finland and Norway by all three measures – reading, maths and science – and worse than the UK. In 2014, 14 per cent of students performed too poorly to qualify for secondary school at 16, a deterioration of 10 per cent on the 2006 level. Last year, the OECD published a report in which it warned: “Sweden’s school system is in need of urgent change.” Underinvestment is not the problem. The Swedes spend more on education as a percentage of GDP (6.8 per cent) than the OECD average (5.6 per cent). The report describes an education system in chaos, hopelessly fragmented, failing those who need it most. It criticises its “unclear education priorities”, “lack in coherence” and “unreliable data”. Swedish schools lack “discipline” and “a calm work environment”, which makes it hard to attract good teachers, says Barbara Bergström, the founder of the Internationella Engelska Skolan, one of Sweden’s most successful free-school chains. The country is expected to face a deficit of 60,000 teachers by 2019. While first- and second-generation immigrants in England and many other countries perform above the national average, in Sweden they have been blamed for dragging standards down. In March this year, Anna Ekström, the director of the government-run Swedish National Agency for Education, claimed that immigration was “not an insignificant” factor in declining attainment. The proportion of students from immigrant families rose from 11 to 15 per cent between 2000 and 2012 and has increased sharply since the beginning of the migration crisis. Perhaps most galling for Swedes is how schools appear to be increasing inequality, rather than eroding it. “We need to put our focus on building equality into the system,” Gustav Fridolin, Sweden’s education minister, said recently. The voucher system has created more opportunities for middle-class parents to ensure that their children attend the best institutions. The OECD report called on Sweden to “revise school-choice arrangements to ensure quality with equity” and “improve the access of disadvantaged families to information about schools”. Bergström notes that only 14 per cent of students assessed using Pisa tests attended free schools. Moreover, even before the reforms of the early 1990s came in, the country suffered because it lacked a culture of rigorous testing. Schools were merely “telling themselves and their parents that things were getting better” when there was no evidence that they were, says Andreas Schleicher, the OECD’s director for education and skills. He views free schools as “more symptom than cause”. Vladimir Putin downplayed past comments about Donald Trump and spoke about the presidential election on Friday, adding that he accepted the US is probably the world’s sole superpower. Asked about the presumptive Republican nominee for president, Putin again described Trump as a “flamboyant” or “colorful” man, using a Russian word – “яркий” – that can be translated with ambiguous connotations, from gaudy to striking to dazzling. “You see, it’s like I said,” Putin told his questioner. “Trump’s a colorful person. And well, isn’t he colorful? Colorful. I didn’t make any other kind of characterization about him. Trump has for months misinterpreted Putin’s comments as “a great honor” and clear praise, rather than consider the various meanings of the word. “When people call you brilliant, it’s always good, especially when the person heads up Russia,” he told MSNBC shortly after Putin’s original comments. Putin also spoke carefully on Friday about the presumptive Democratic nominee, Hillary Clinton, saying he did not work much with her directly when she was secretary of state. “She probably has her own view of US-Russian relations,” he said. The diplomatic remarks belie the cold and increasingly hostile relations between Clinton and Putin toward the end of her time in the Obama administration. In 2011, when he was prime minister of Russia and facing massive street protests, Putin accused the then secretary of state of fomenting dissent. Clinton’s state department, he said, had sent a “signal” and “support” to opposition leaders. On Friday Putin insisted Russia does not interfere in other nation’s affairs, and that the Kremlin would be glad to work with any leader elected abroad. “We need to bring back trust to Russia-European relations and restore the level of cooperation,” he said. Sanders had a point. As I’ve noted before, he has expanded the political space and put issues like inequality and political capture front and center. He isn’t just another Democratic politician—he is the tribune of a progressive movement that emerged from the antiwar demonstrations, the Occupy Wall Street phenomenon, the nationwide effort to boost the minimum wage, the outrage over the Citizens United ruling, and the general disenchantment with money politics. When Elizabeth Warren declined to enter the Presidential race, Sanders stepped in, running an insurgent campaign that conveyed a clear message and relied on small donations—more than eight million of them. “We showed the world that we could run a strong national campaign without being dependent on the big-money interests whose greed has done so much to damage our country,” Sanders pointed out. Even establishment Democrats concede that Sanders ran an impressive campaign, forcing Clinton to move left on issues like trade, Social Security, and the Keystone pipeline. But what now? The primary season ended last week. Clinton won fifty-six per cent of the popular vote and fifty-five per cent of the elected delegates. As MSNBC’s Steve Kornacki pointed out the other night, this primary contest wasn’t a squeaker in the tradition of Walter Mondale’s victory over Gary Hart, in 1984, or Barack Obama’s win over Clinton, in 2008. It was a solid win, like Jimmy Carter’s over Ted Kennedy, in 1980, or Bill Clinton’s over Jerry Brown and Paul Tsongas, in 1992. This was fighting talk, and Sanders followed it up with a long series of policy demands, several of which Clinton has so far resisted despite her recent moves to the left. 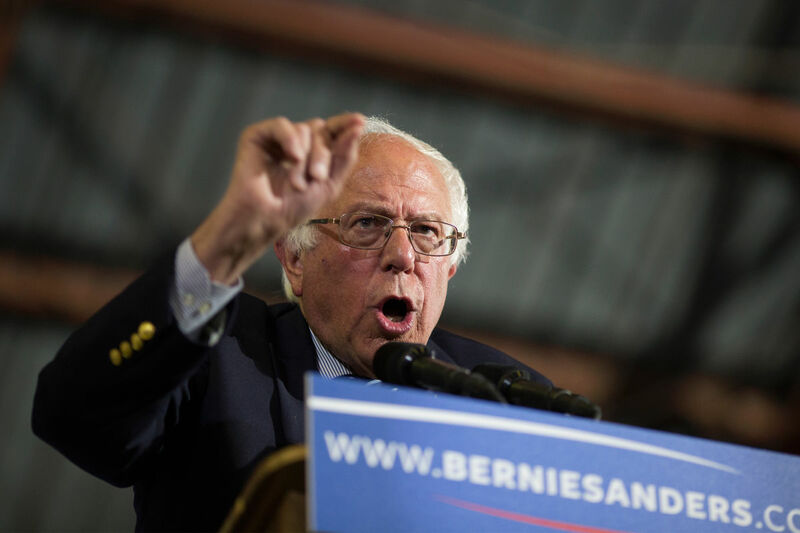 Sanders reiterated his calls for free tuition at public universities and colleges, a federal ban on fracking, a tax on carbon, and “modern-day Glass-Steagall legislation” to break up the big banks. While the Clinton campaign has indicated that it is willing to make some concessions on the Party platform, it seems unlikely that it would be willing to go as far as Sanders wants on these issues.